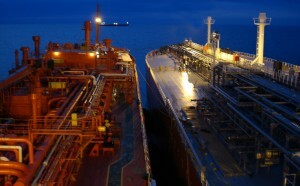 Ship to Ship operation (STS transfer) is a crucial process of crude oil transfer operations between Ships (either one ship is anchored or both are underway) at sea .Divine Marine Shipping Ltd possesses the necessary expertise to undertake STS transfer operations of varying sizes and conditions with strictest adherence to OCIMF and ICS guidelines. Our safety record is unprecedented in Ship to Ship crude oil, petroleum products, Bulk Ore and chemicals transfer operations attributed to our dedicated technical staff with total years of experience spanning to over 210. STS transfer operations entails the approach manoeuvre, mooring, hose connection/disconnection for liquid products, cargo transfer and unmooring. Divine Marine also provides all necessary support services to ensure hitch-free transfer operations. Our staff are all approved STS Superintendents with excellent safety records and Oil company trained. However we are among the most versatile ship to ship transfer service providers that adhere strictly to all international, regional and safety regulations.